If you ride a bicycle and you choose to wear a helmet, there may be a benefit to you in you crash. However if you choose not to wear a helmet, the overall health outcome for you is positive and you are saving the taxpayer money. That’s because the health benefits of riding a bicycle outweigh all the risks by a large factor. For example an article in the British Medical Journal compares the health benefit of riding public share bikes with the risks and finds a large net benefit. The British Medical Association publication “Cycling: Towards Health and Safety”. 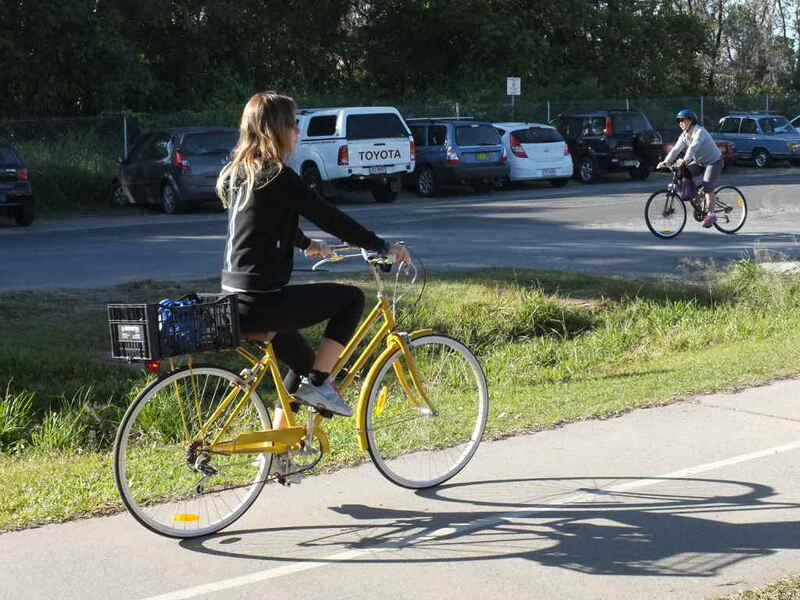 Oxford University Press; 1992. found that “in spite of the hostile environment in which most cyclists currently ride, the benefits in terms of health promotion and longevity far outweigh the loss of life years in injury on the roads.” Bicycling: Health Risk or Benefit? reported “Benefit to risk ratios ranged between 9 to 1 and 96 to 1.” in a range of studies. Note that helmet wearing rates are far below Australia’s for these studies. In “Physical Activity in Australia: A Snapshot, 2007-08“, the Australian Bureau of Statistics estimated that the direct health care costs due to physical inactivity in Australia were almost $1.5 billion in 2006-07. Cycling in the Netherlands, where helmet wearing is rare, saves the health budget 3% of GDP, see Dutch Cycling: Quantifying the Health and Related Economic Benefits. 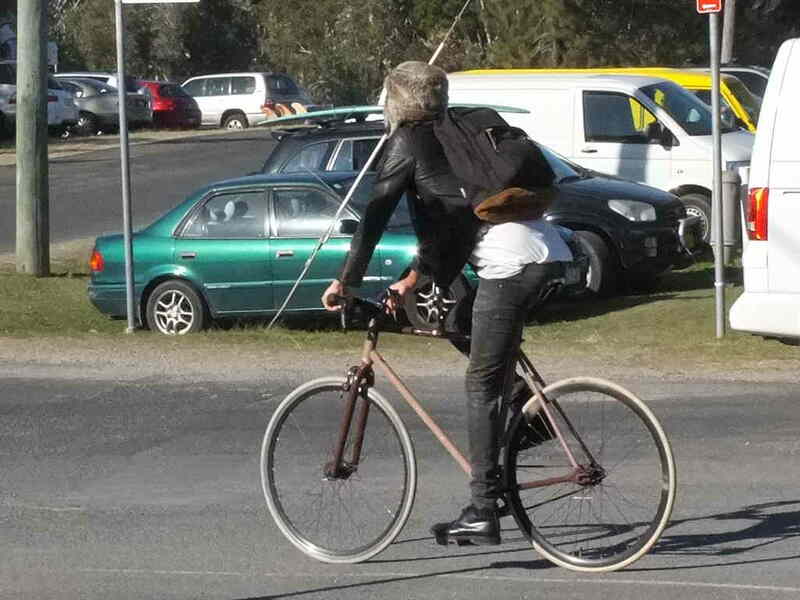 So when you see someone riding a bicycle without a helmet, you can be glad they are saving you money. By the way, the health benefits of riding are approximately 50% of the total benefits (the other benefits include congestion, pollution etc). Next time somebody tells you that you should pay your own health costs if you ride without a helmet, ask whether people who don’t ride a bicycle should pay a lot more than that towards the higher health costs due to inactivity. 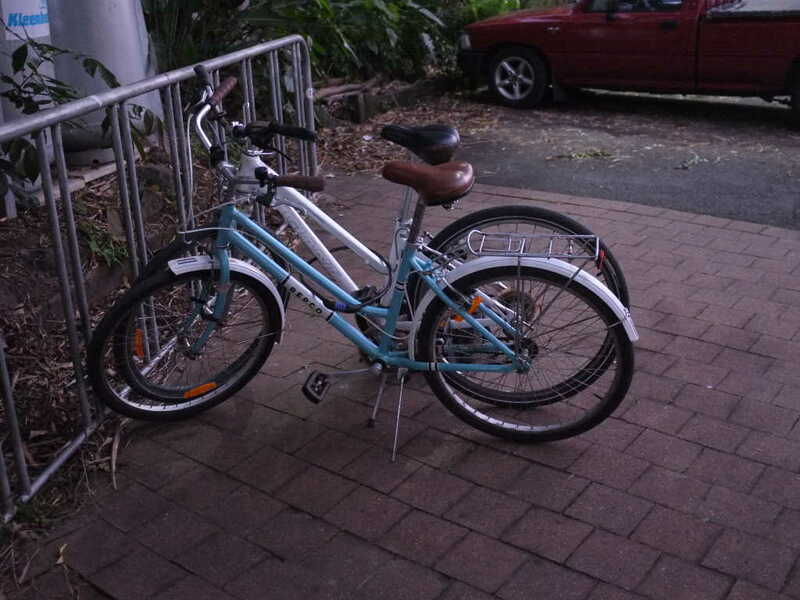 Two of our members had a short break in Byron Bay this year (2014). The front cover of the tourist ‘Byron guide’, available everywhere, features two images on its front cover. 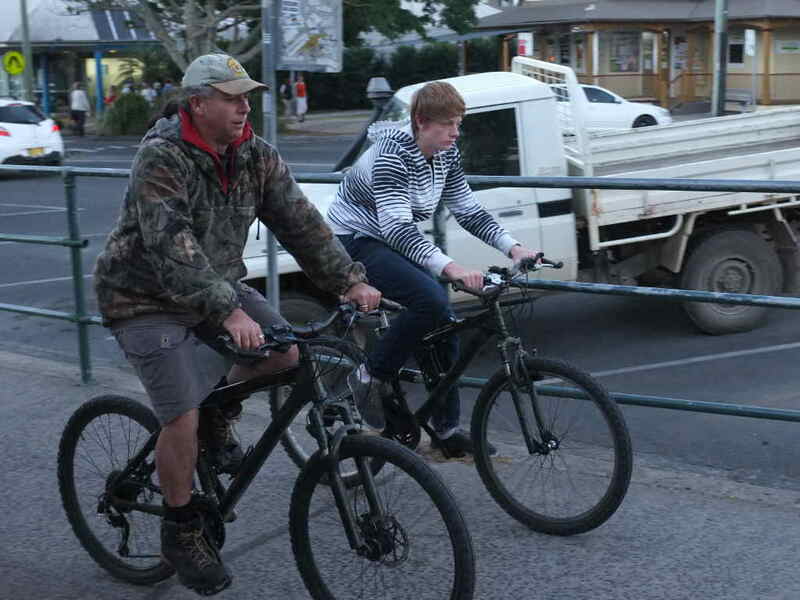 One is a male and the other a female bike rider without helmets riding through empty streets. This tells us two things. 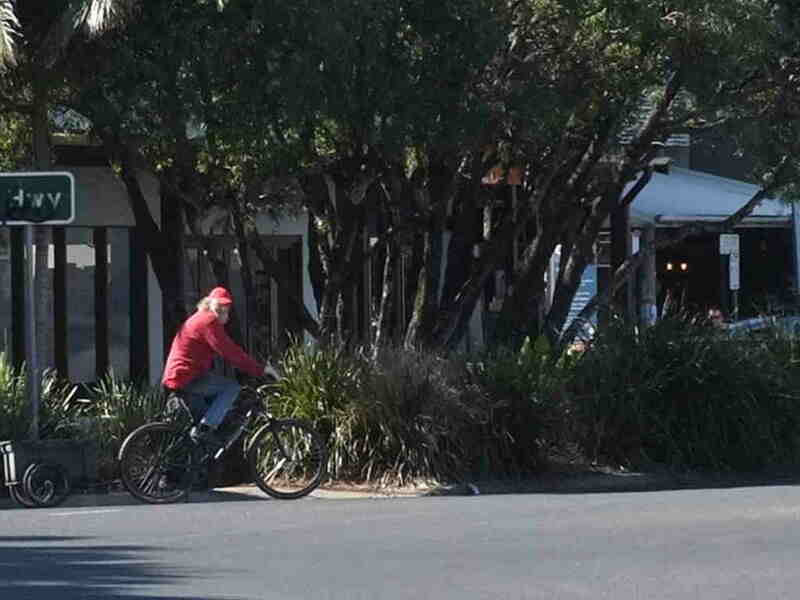 That the image of helmetless cycling is good for tourism as is a car-free streetscape. 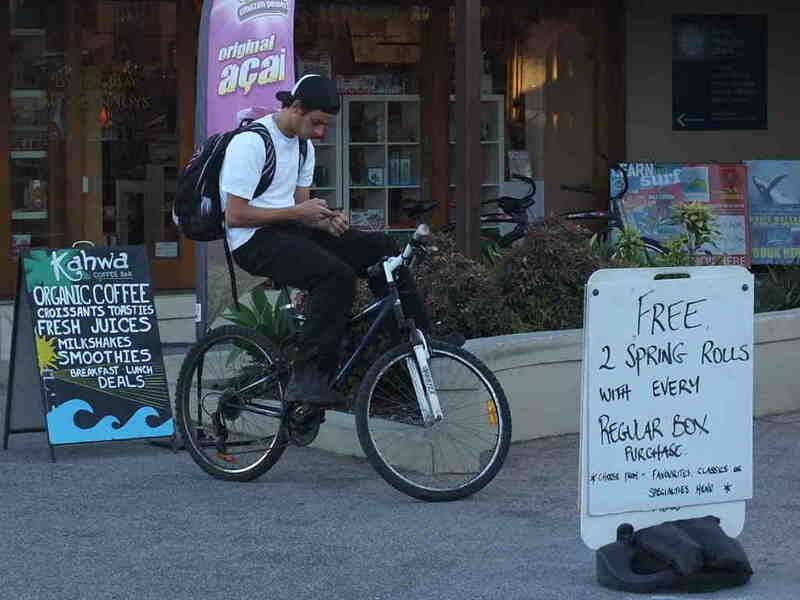 Byron Bay delivered on the first of these with helmet free cycling being completely normalised. 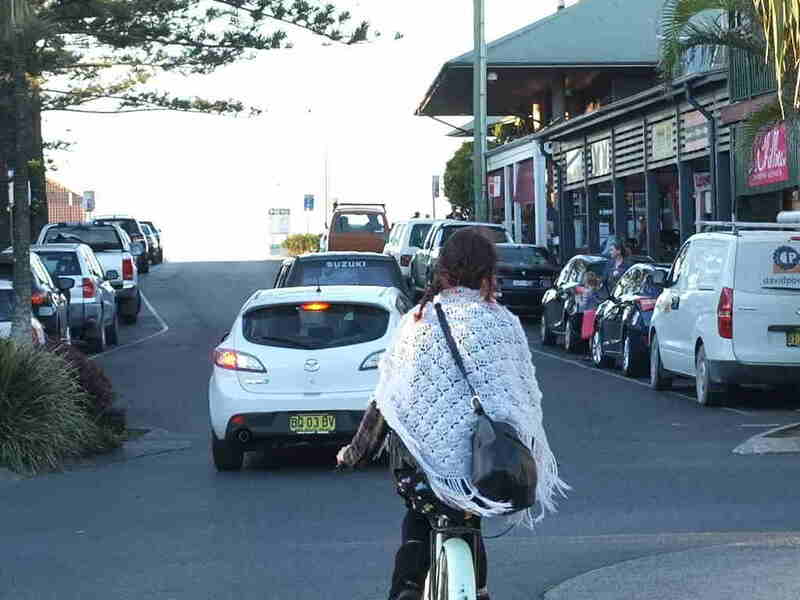 The traffic however, was very Australian, with most holiday makers and locals choosing the car as their preferred mode of transport. I wouldn’t be prepared to guess at modal share but it was not as high as I’d hoped. 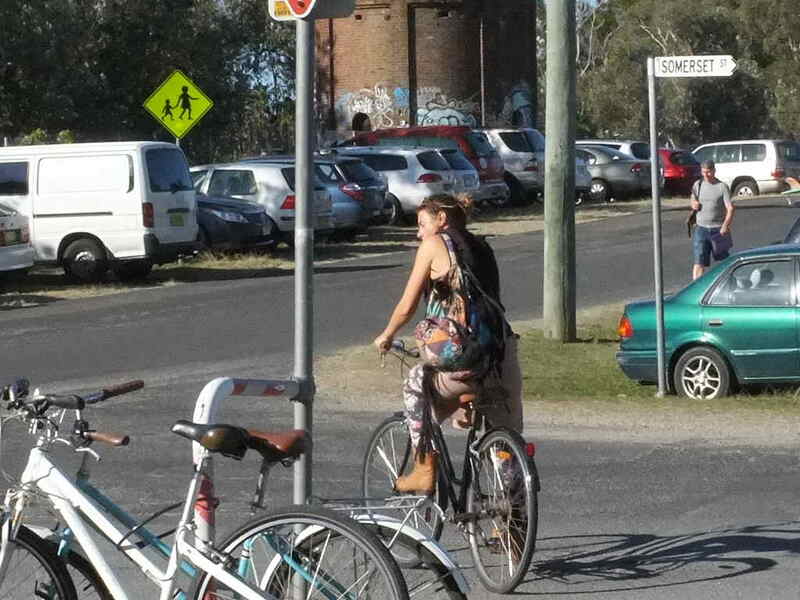 Female cyclists rode in the traffic, without helmets and apparently without anxiety. 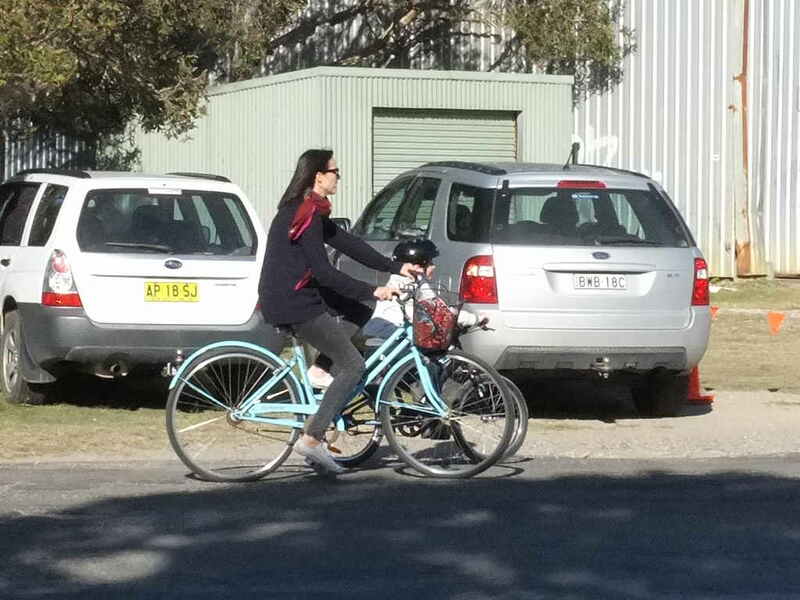 It is often said that women will not cycle without good infrastructure.While my observations require further empirical research, it seems that the presence of so many unhelmeted and female cyclists had begun a cultural shift in driver behaviour that made it safe enough for many women to ride. 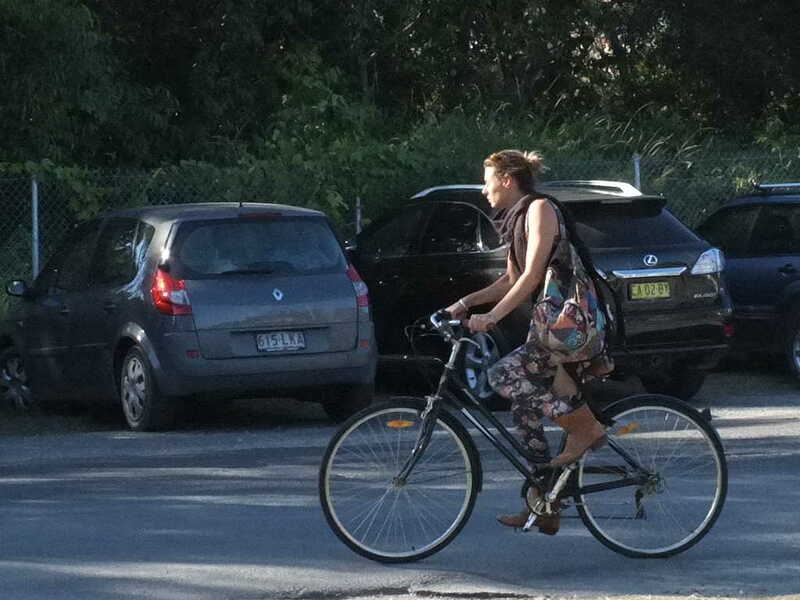 The photos above don’t really do justice to the variety and style of the everyday cycling I witnessed . It was a delight – like being in another country. 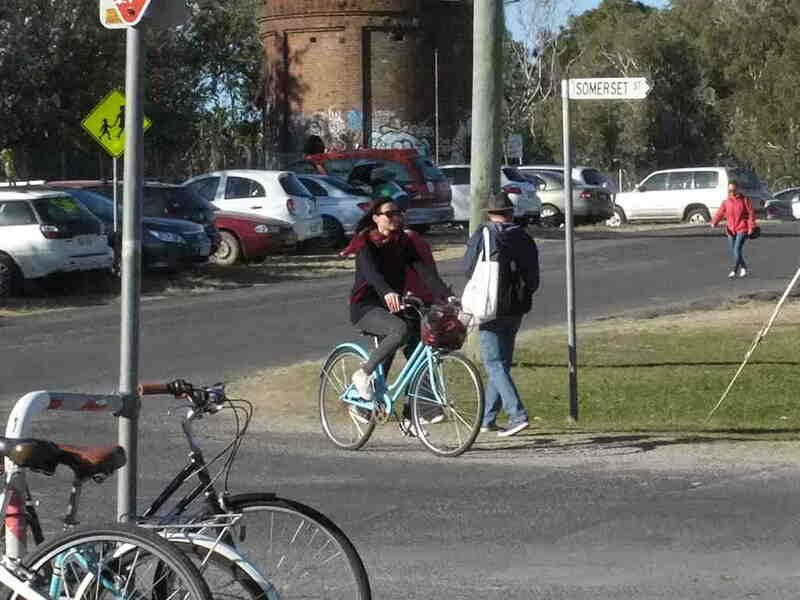 The recent announcement of cyclist registration in NSW, plus increasing fines, including $319 for not wearing a helmet and other higher fines is anti-cyclist legislation by the notoriously anti-cyclist NSW state government. 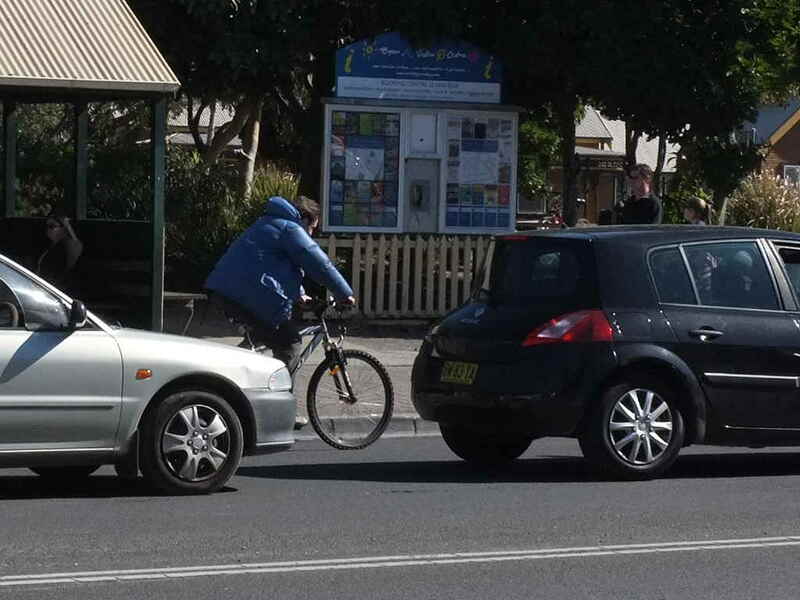 This is the price they have levied for introducing a one-meter rule, and the higher fines and cyclist registration is believed to be supported by Cycling [sport] NSW and the Amy Gillett Foundation. 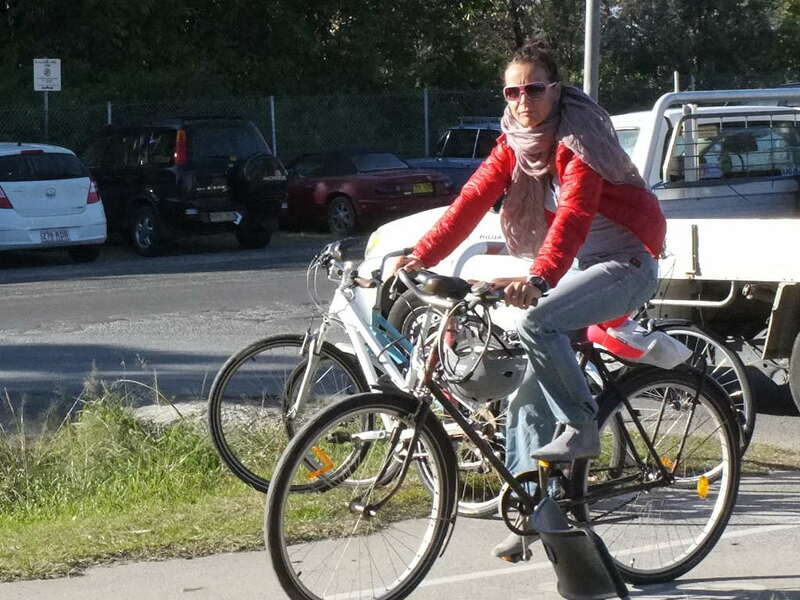 These sport-cycling organisations have no idea how much they are setting back the all-too-gradual increase in everyday use of the bicycle for transport. 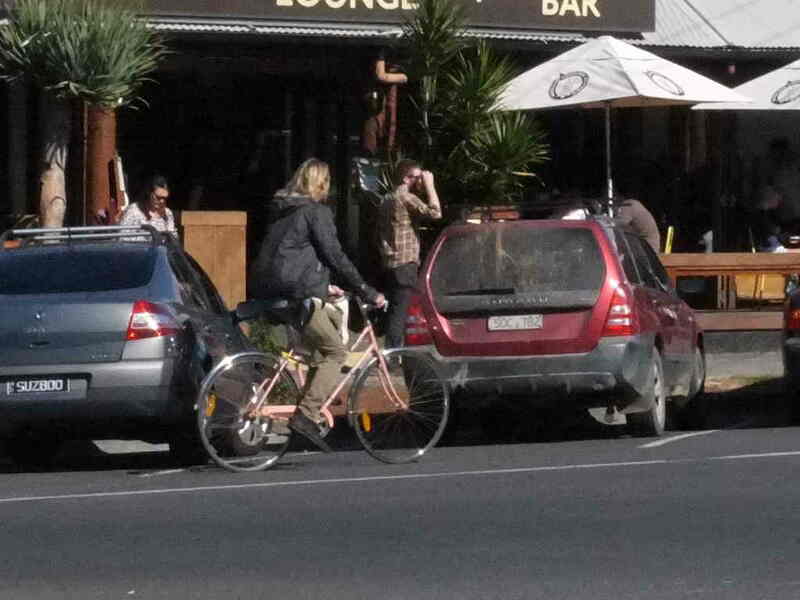 Sports cyclists ride on the road with cars and feel that they benefit from a one-meter rule, fair enough – but not at the price of laws that make cycling less convenient and attractive to the majority. It appears that the Queensland Police do not like the one meter law and are not enforcing it, even refusing to take action when a breach was filmed. 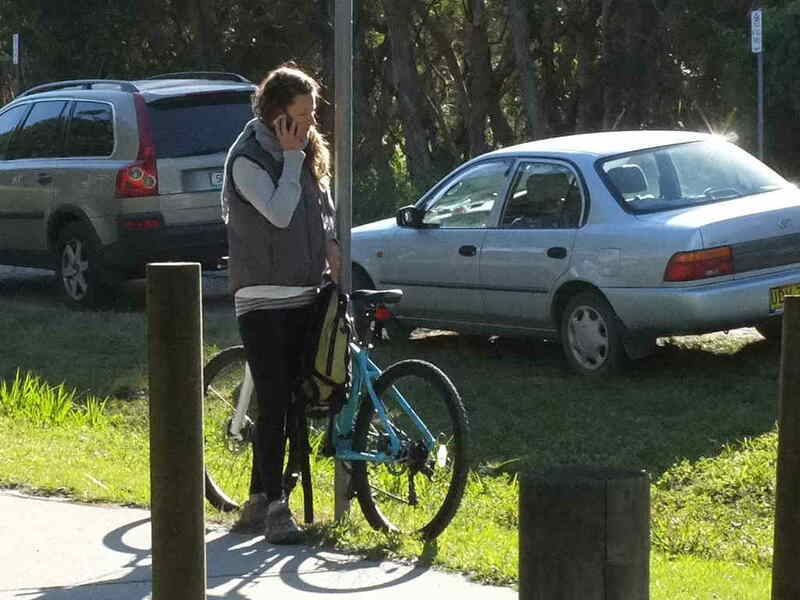 They have instead made a point of singling out cyclists for enforcement – and of course there are now higher fines to hit cyclists with. So if you were in favour of a safe passing distance law, make sure the police are on board first. 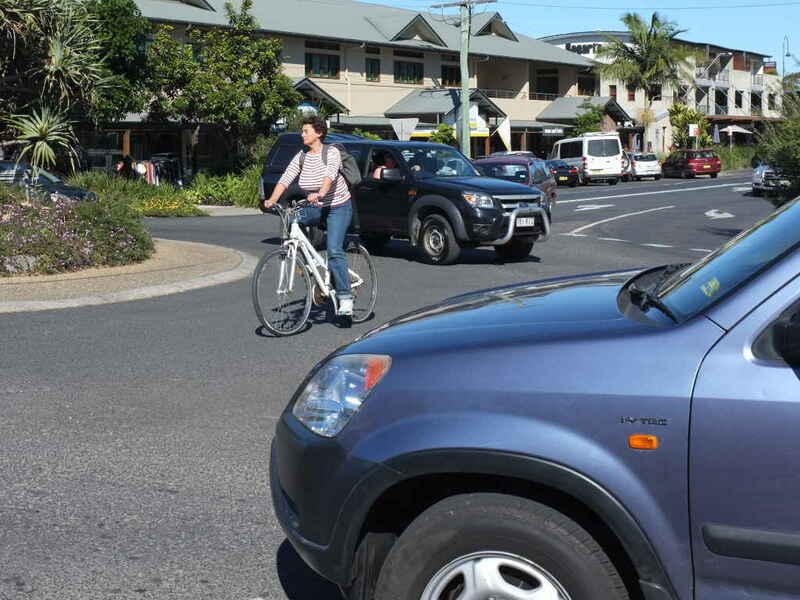 The recent Queensland Parliamentary enquiry into cycling recommended a law for a minimum passing distance when a motor vehicle overtakes a bicycle. The minister was quick to announce that this measure would be implemented, while at the same time saying he opposed the committee’s recommended reform to helmet law. On the surface, a passing distance law looks like a good thing. Most of us would welcome a decent distance between ourselves and a car that overtakes us. Others criticize the law as “unenforcable” or not evidence-based (i.e. it won’t reduce collisions). 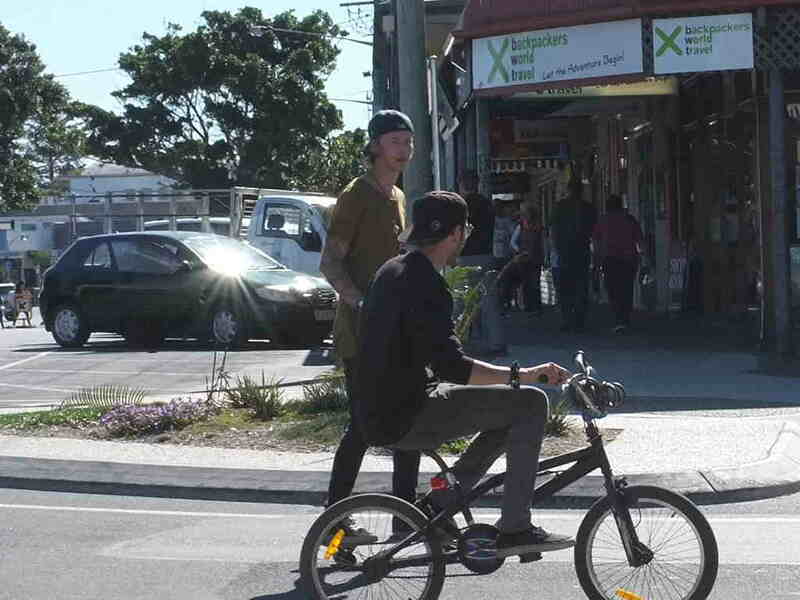 Freestyle Cyclists’ view is that the law is at best an interim measure for arterial roads, but more importantly we should be working to get safe, protected bike lanes, and action on local streets to remove rat-running through traffic and reduce speeds. The problem with interim measures is that they take the pressure off government to do the harder but more effective things that are needed. 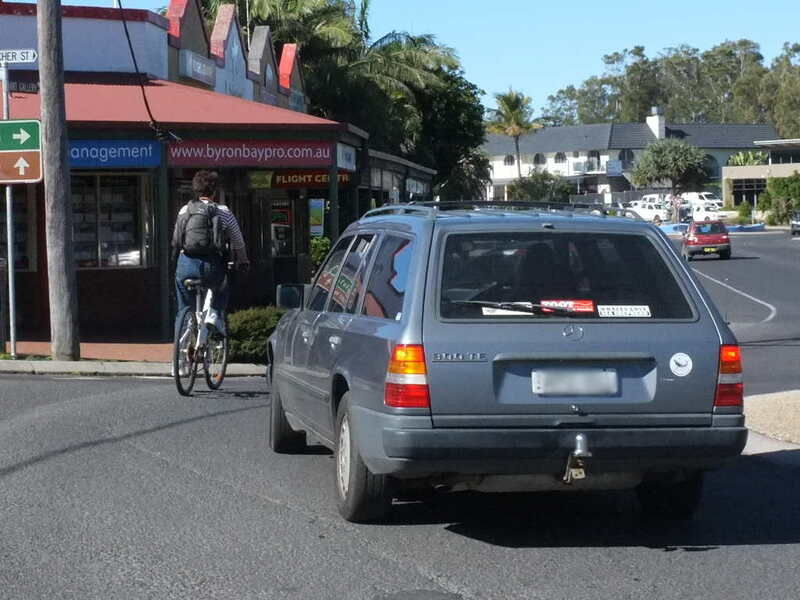 A more fundamental problem with a passing distance law is that it relies on motorists to see cyclists and act appropriately. Any safety system that primarily relies on vigilance by motor vehicle operators has failure built in. Of course the need for care and attention by drivers can’t be dispensed with (self-driven cars aside), but the less the road system relies on drivers to pay attention, the better for safety. This is the principle behind the Dutch system of “sustainable safety” by the way. Hi-viz clothing is a flawed strategy for the same reason. Sport cyclists ride on the road, often in large bunches, at high speed. 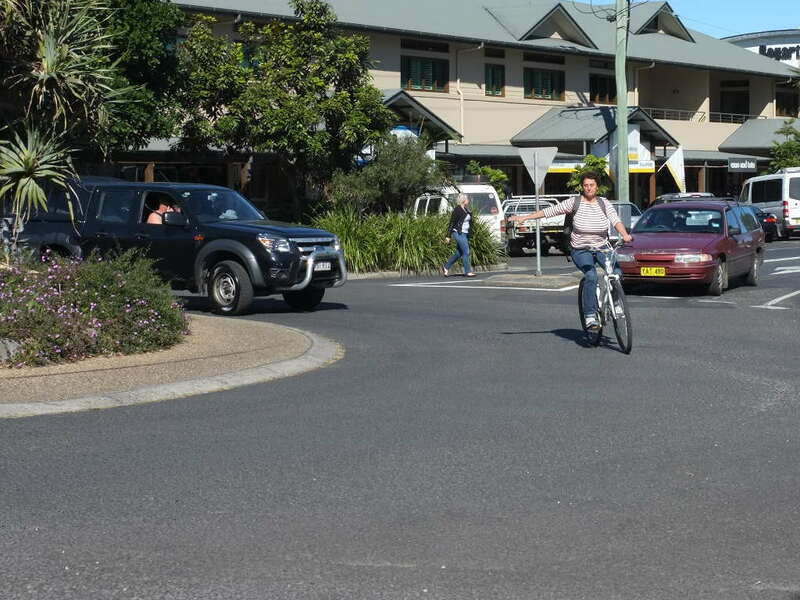 They don’t see protected bike lanes as part of the solution, because such lanes aren’t suitable for their needs. 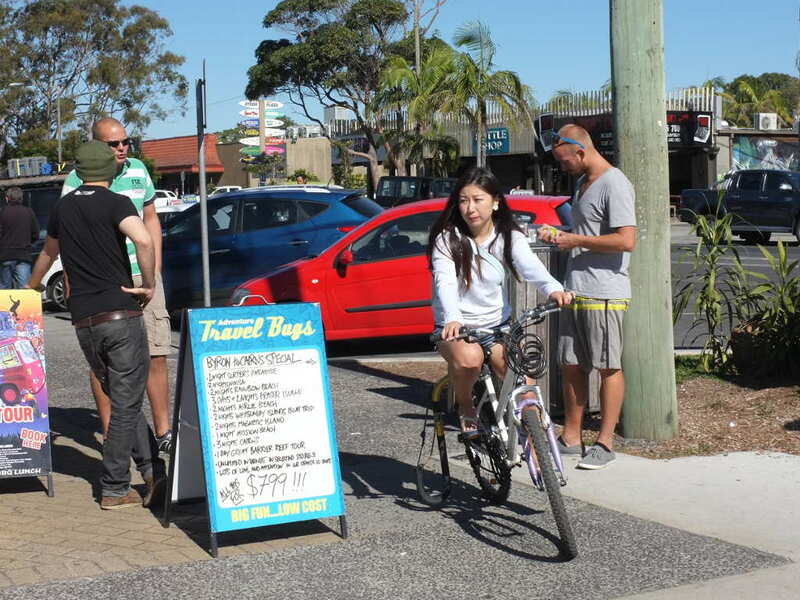 Sports Cycling organisations who promote measures that suit sport cyclists, are not helping to promote cycling by everyday people for their daily transport needs. Seat Belt laws – relevant? Campaigners for helmet choice are often asked “do you support seat belt laws”, as though this is relevant. More relevant would be a question about laws forcing motor vehicle occupants to wear helmets, but somehow that subject isn’t of interest to medicos, law makers and others who profess to want to make our roads safer. Seat belt law isn’t in our province of interest or knowledge, but what we do know is that there is no down-side to public health, better cities, resource depletion nor air pollution from making seat belts compulsory. Actually there might be a down-side to public health, because it’s possible that wearing seat belts encourages more dangerous driving, which increases risks for pedestrians and cyclists. In contrast, bicycle helmet laws do reduce public health, do make cities’ roads and public transport more congested, do cause more fossil fuels to be burned which pollute the air with carcinogens and carbon dioxide. That’s because helmet laws discourage cycling. 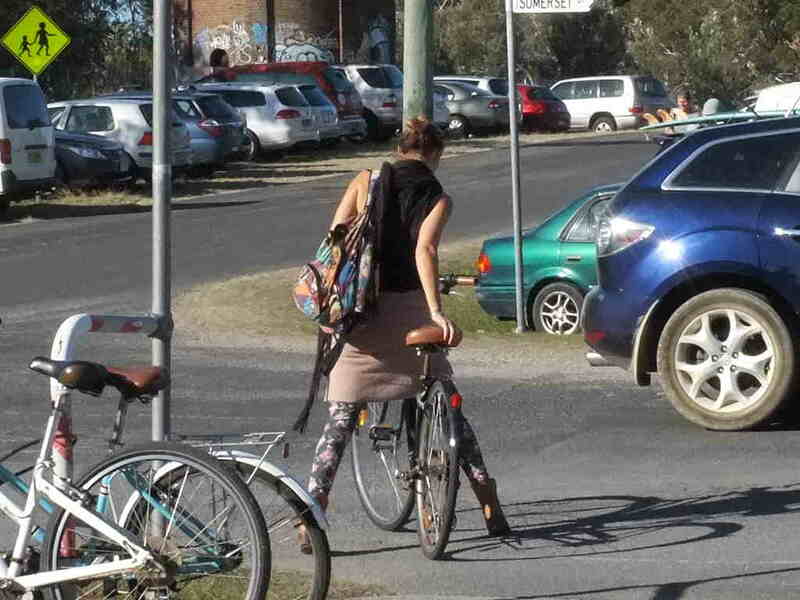 What Stops People from Cycling? 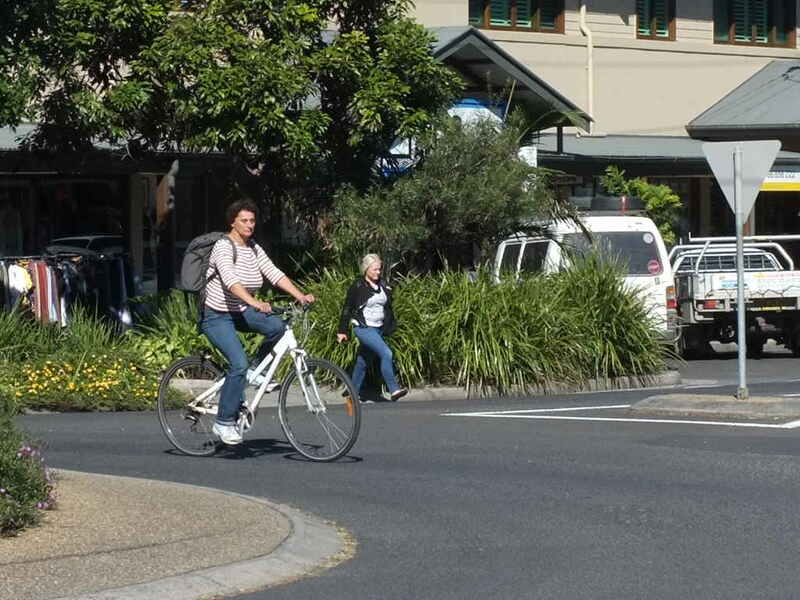 It’s generally agreed that “not feeling safe” is the biggest single reason that people give for not using the bicycle for transport. The second biggest reason is “compulsory helmets”. 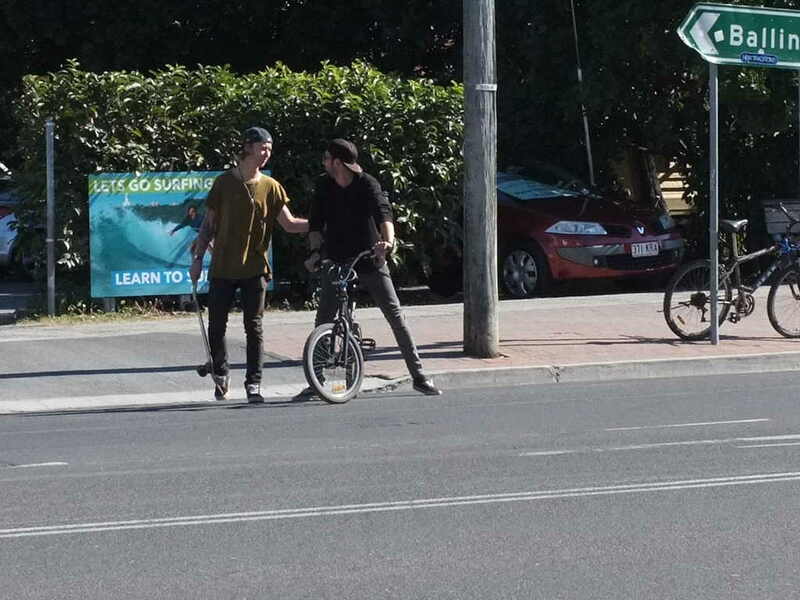 These two are closely related – making helmets compulsory, even promoting them, reinforces the belief that cycling is dangerous. 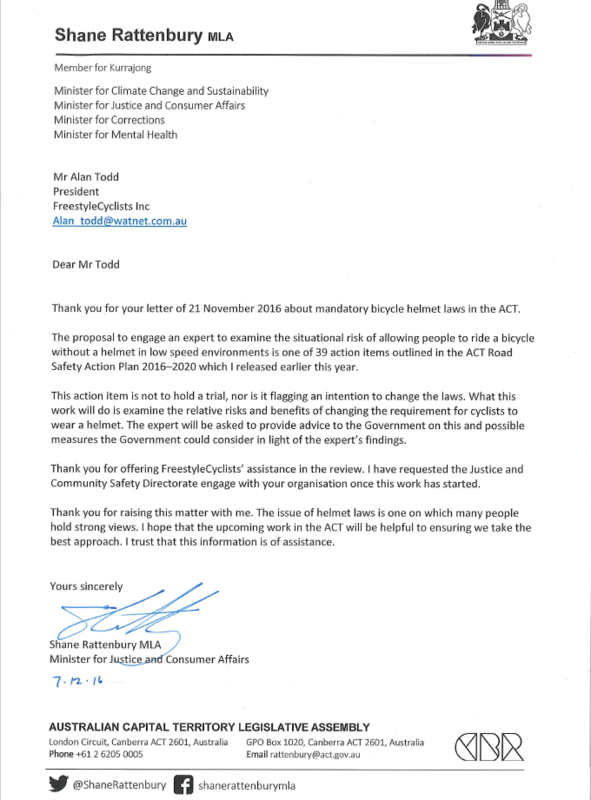 The Victorian Transport Accident Commission (TAC) provided a response to a question on notice from the Senate Enquiry into Personal Choice and Community Impacts stating that 28% of respondents who had ridden a bicycle in the last 6 months cited “dislike wearing a helmet” as influencing their decision to ride a bicycle. Their evidence to the Enquiry, along with others, can be viewed in full at http://www.aph.gov.au/Parliamentary_Business/Committees/Senate/Economics/Personal_choice/Additional_Documents. Note that the TAC evidence includes sections of three documents, the third of which includes this survey result (search on “helmet”). Research into Melbourne Bike Share (chart above) found that 25% of people didn’t use it because they “didn’t want to wear a helmet” while 9% cited “Safety Concerns”. 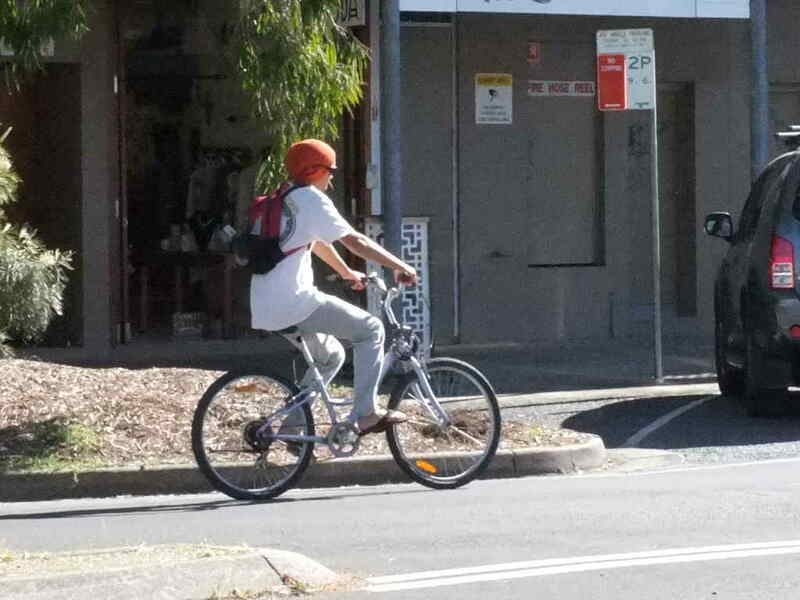 In “The possible effect on frequency of cycling if mandatory bicycle helmet legislation was repealed in Sydney, Australia: a cross sectional survey” (University of Sydney), it was found that 22.6% of people would ride more if they could choose whether or not to wear a helmet. 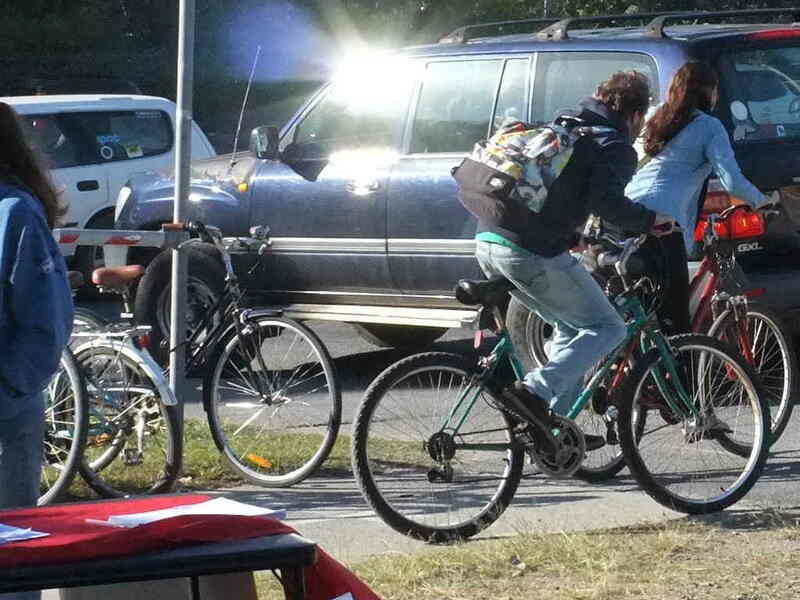 Would New Zealand adolescents cycle to school more if allowed to cycle without a helmet? 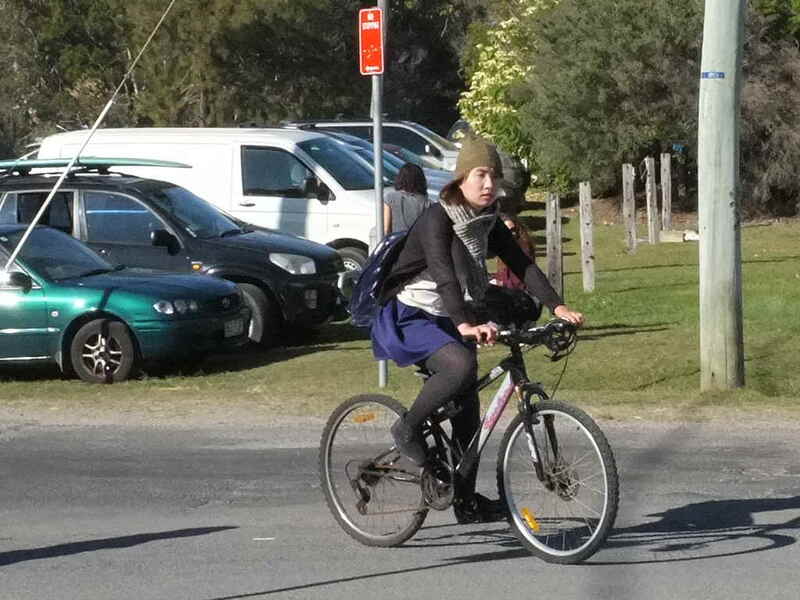 West Australian government survey in 1993 found “…of adults … (n = 254), 28 .0% of adults from the Perth sample, and 25.0% of adults from the country sample, reported they would cycle more if they were not legally required to wear a helmet (p 19)”. 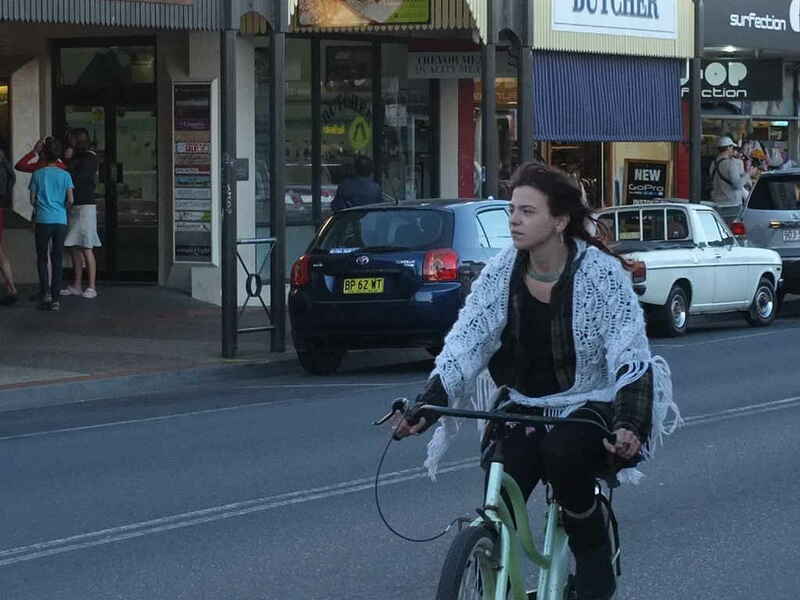 When the South Australian Royal Auto Association surveyed their members, they found that 27% would “cycle more” if there were no helmet law. 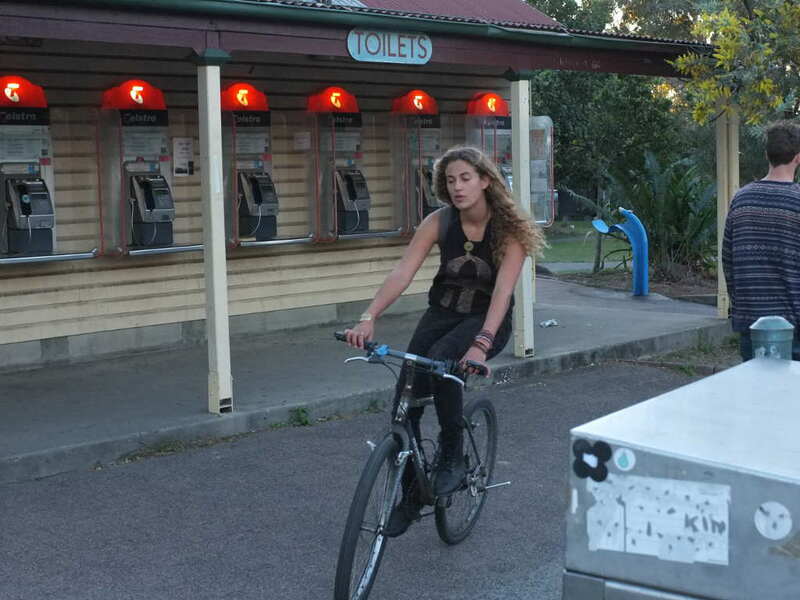 In other countries, where laws require children/youths to wear helmets, their use of bicycles declined significantly (one example). Darwin has the highest figure for any Australian capital city. What happened when helmet laws were introduced? 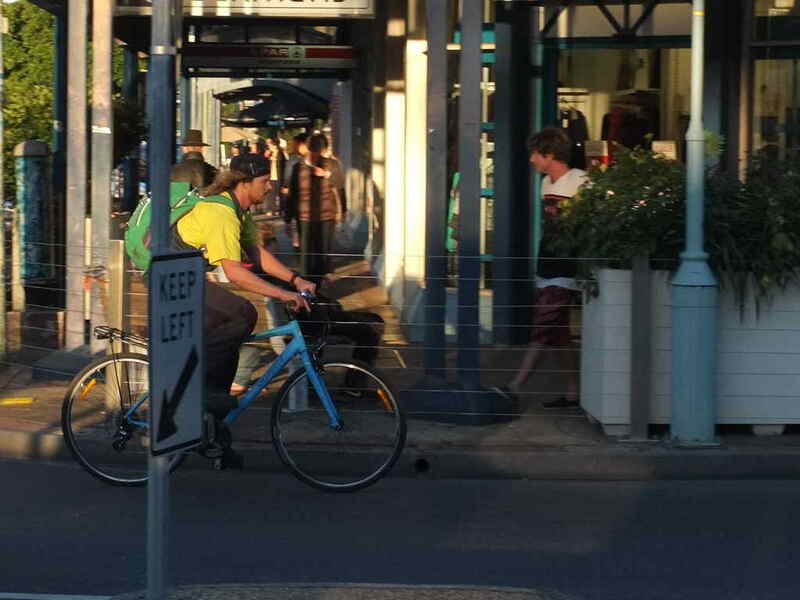 The percentage of people using bikes to get to work is measured every five years in the Australian Census. You probably remember filling in the big census form every five years yourself. Helmet laws reduced the number of people cycling dramatically, and numbers are still lower today than before helmet law came in. Apart from dragging down progress towards better cycling conditions and getting more people using bikes, this also means that fewer people are getting the health benefits of riding a bicycle to work. Even if the claimed benefits of helmet law are as big as governments make out, the health effects of getting less exercise are a much bigger loss. Overall, helmet law reduces the people’s life-span, increases disease and costs the health budget money. See Prof Piet de Jong’s paper (Professor of Actuarial Statistics, Macquarie University). Below is a graph of census data on transport in New Zealand. Helmets were made compulsory in New Zealand in 1994.
taken from Sandar Tin Tin et al, International Journal of Behavioural Nutrition and Physical Activity. 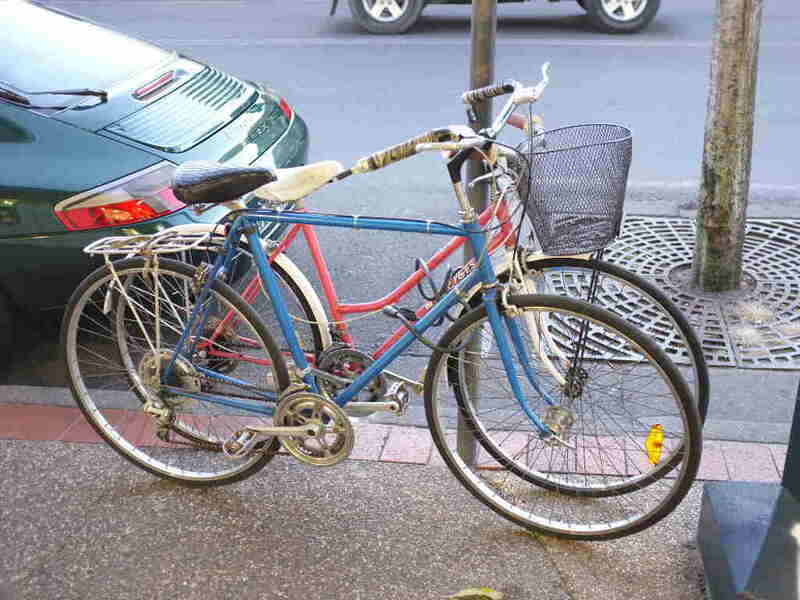 Also in New Zealand, In 1987/88, before the introduction of helmet laws, 4.4% of New Zealanders cycled to work, 11.6% cycled to primary school and 18.6% to secondary school. By 2004/08, only 2.2% and cycled to work, 4.3% to primary school and 4.9% to secondary school. These data are from NZ Ministry of Transport: How New Zealanders Travel . Spreadsheet available at: www.transport.govt.nz/research/travelsurvey/latestresults. 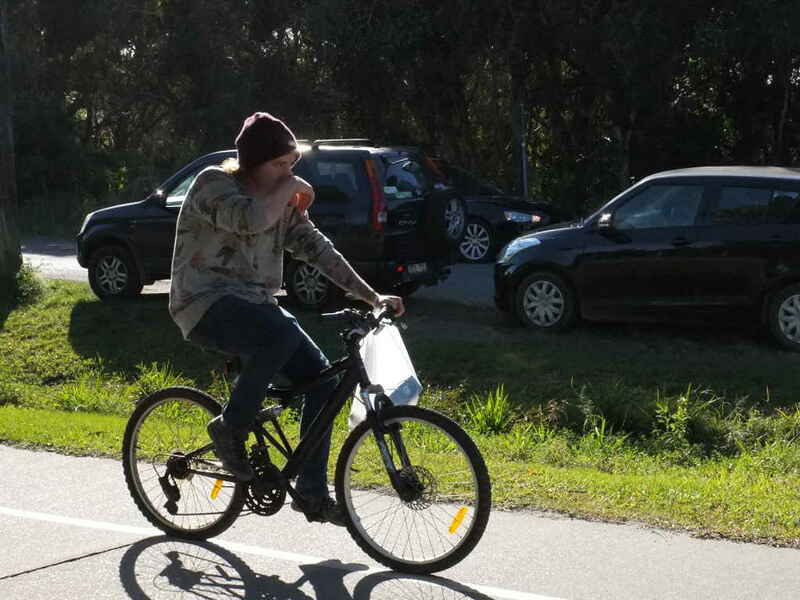 In Victoria, the study relied on by the Government to claim that cycling didn’t decrease after helmet law shows the opposite. The count in 1990 was pre-law. Both counts post-law shows a large drop except for one site at which a large organised group of over 400 cyclists inflated the final year’s average. The chart at right is from http://crag.asn.au/2621 and shows the numbers at the distorted site in red. The study was funded by Vicroads who didn’t fund a further year’s count, as they couldn’t be sure another big event would prop up their figures. This one graph tells us a lot. 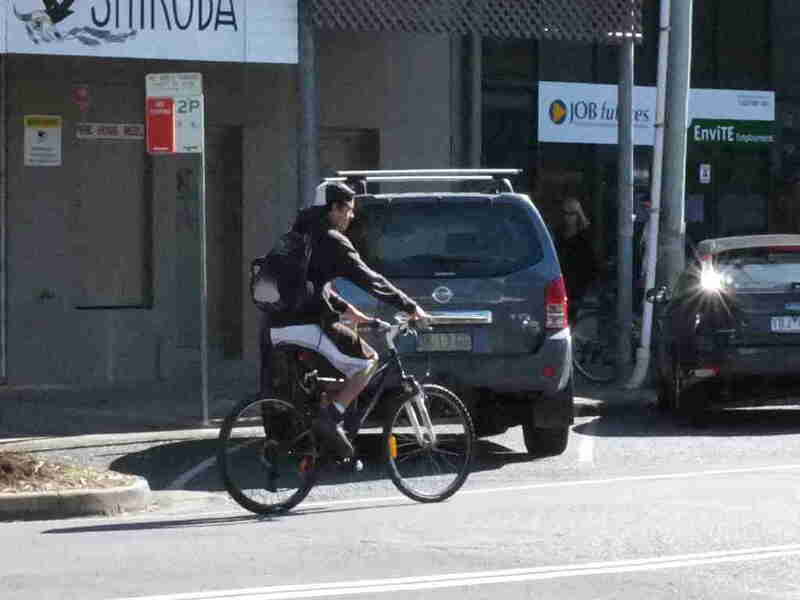 Introduction of helmet laws discourages the safest cyclists, and changes the mix of cycling activities in the population – because racing cyclists and mountain-biking cyclists wear helmets as a matter of course, the law doesn’t affect them. 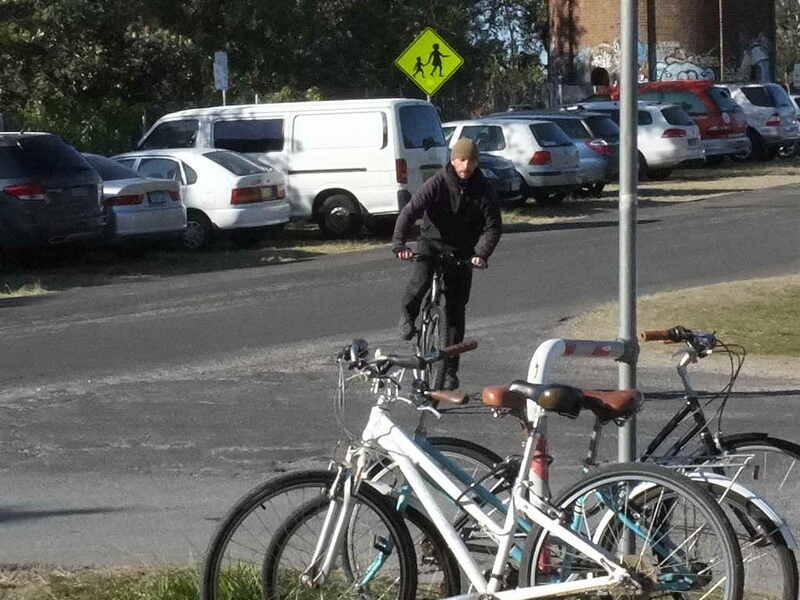 Everyday cycling, the safest type of cycling, is discouraged because most people won’t do this type of riding if they feel it is unsafe. 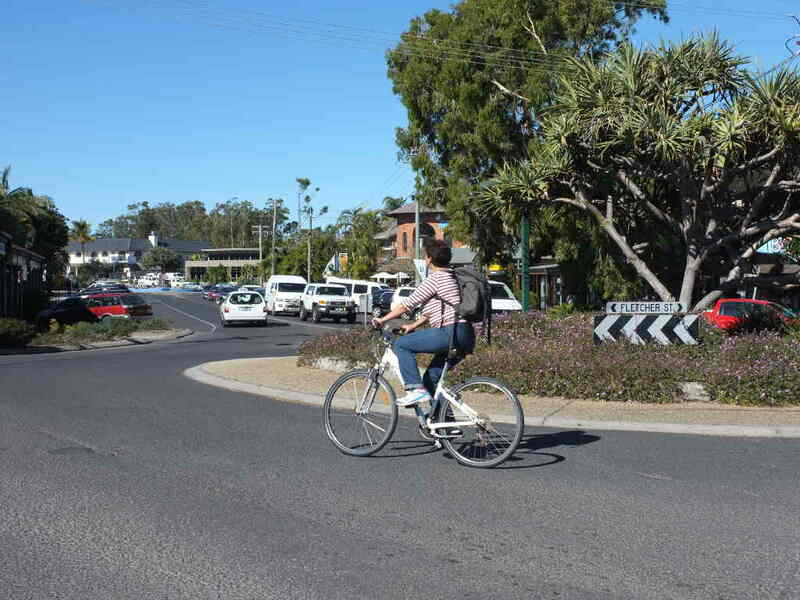 So the mix of accidents also changes – the type of risky cycling that is more likely to result in head injuries becomes a larger share of cycling crashes. 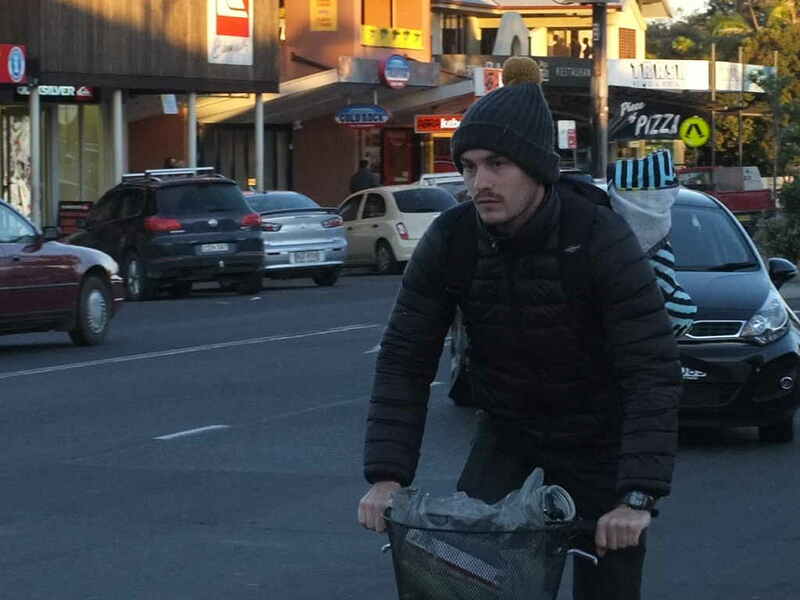 So even though a helmet may offer some level of protection in the event of a crash, a helmet law removes the safest cyclists and those least likely to have a head injury in the first place. 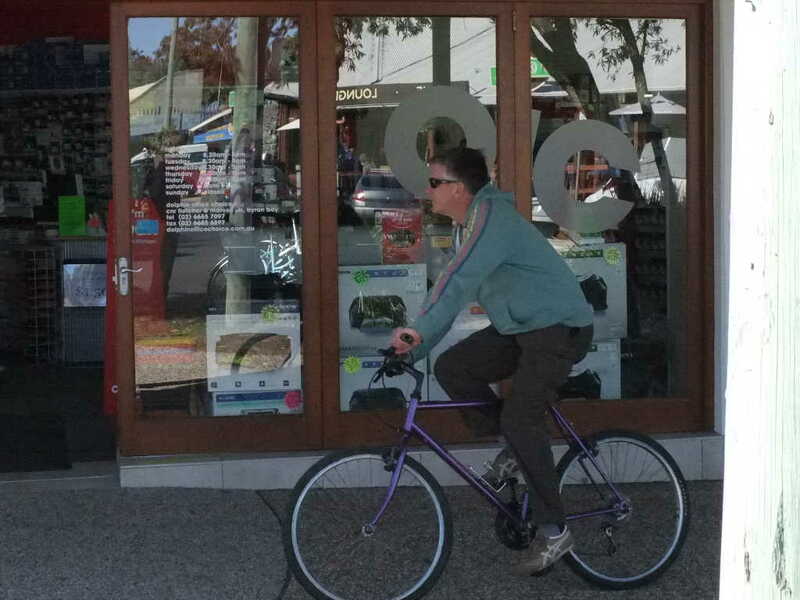 By discouraging this type of cycling, the health benefits lost outweigh any gain from increasing helmet wearing rates.